FOR THE VAST MAJORITY OF PEOPLE ON HOLIDAY, THE OPPORTUNITY TO SWIM IN AND RELAX BY A WELL-MAINTAINED SWIMMING POOL IS A MAJOR PART OF THE ATTRACTION OF WHERE THEY ARE STAYING. The problem in the New Zealand climate is that even when the pool is heated, cold winds and rain make the swimming less attractive and the relaxation part, impossible. What a difference it would make if that pool could be enclosed in a weather-proof bubble. with both facilities and reputation. The park already had a great deal going for it as a place for a holiday. Only eight minutes from town, close to Lake Rotorua but without the sulphur smells, All Seasons Holiday Park was an ideal accommodation base for visits to Rotorua’s many cultural, thermal and adventure attractions. It is the closest accommodation provider to the Rotorua International Airport and is often used for first and last night stays or visitors arriving and departing from the airport. 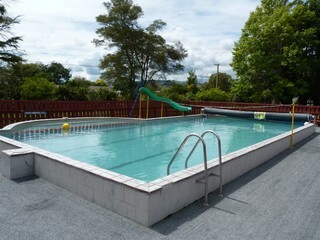 The Qualmark 4-star Rotorua holiday park offers a choice of quality selfcatering accommodation to suit all budgets and needs, including paraplegic facilities. Located in three hectares of peaceful land, it has 12 self-contained units, four cabins (which use communal facilities) three caravans, a 50-bed lodge, 82 powered sites and 22 unpowered sites. There are plans to add three more family units in time for Christmas. The park’s affordable accommodation options and camping sites make it ideal for couples, families, backpackers, groups and campervans. 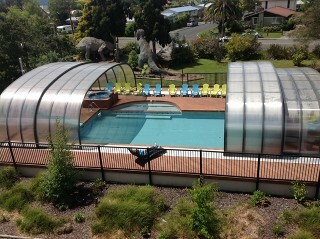 For children, a major drawcard is that All Seasons Holiday Park even has its own dinosaurs. Rotorua, with its geysers and steam pools, is somewhat reminiscent of a time long ago when dinosaurs roamed the earth, and the park has 18 life sized examples scattered around the grounds. 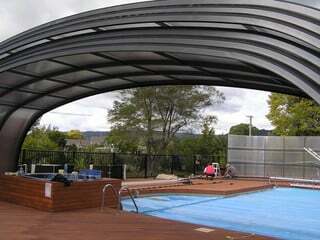 Made from steel box section, rebar, mesh and mortar, they were originally made for a thermal area in Taupo in the early 1990s but after passing through other hands, became available for purchase. “We put our hand up for them knowing they would be a point of difference and provide a theme for us to run with,” Mr Thornborough said.